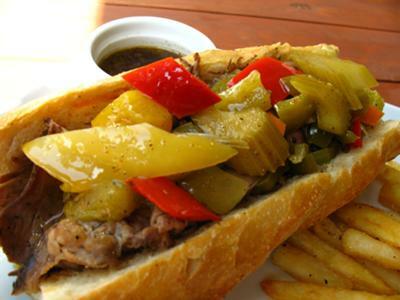 placed in the Expo GDL area, near plaza del sol, you can find the best Italian Beef "sangwitch", how they call it. Thin slices of meat served into a crusty bread with meat juices and home made Giardiniera. Also, you can taste BBQ Beef Sangwitch, onion rings, cheddar chees and crusty bacon. Tther options is the Italian quesos. gratin chees, a hot sandwitch. Delicious.